Many years ago I owned a Speed Graphic with a 135mm Optar lens but made very little use of it. This was around the time when my kids were getting to the demanding stage and time for photography was at a premium. On the rare occasions when I could find a few moments to disappear with a camera, it always seemed easier to sling a Nikon over my shoulder rather than dig out the Speed Graphic. As a result, I shot no more than a few sheets of film before deciding to sell it on. 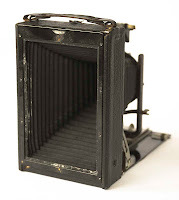 I've always fancied having another go at large format photography but I've always known it would never be anything other than an occasional diversion and couldn't bring myself to "invest" in another 5x4 camera. 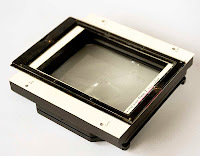 However, for a couple of years I've had a 5x4 ground glass back and a few DDSs sitting in a drawer and I started wondering if there was some way of pressing them into service. It looked as if some sort of cone-shaped affair would have to be attached to the back with the lens on the other side of the cone. With a wide angle lens set at its hyperfocal distance, I worked out that I could get everything from just over four feet to infinity acceptably sharp at f32. 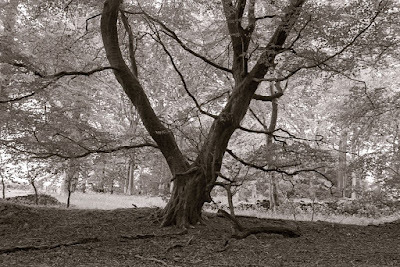 Since the intention was to use the 5x4 for long exposure photography where shutter speeds of 15-120 seconds are the norm, I didn't need a shutter and was going to use an old enlarging lens just to get started. Half plate is just about the same width as 5x4 but slightly longer so I knew it would provide enough coverage but I wasn't sure if it would be easy to attach the 5x4 back to it. 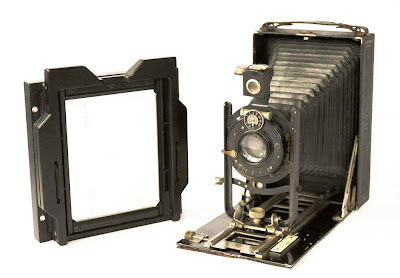 Well, there was only one way to find out so I parted with £20 on a Goerz Tenax folder from the early 1900s that was scruffy-looking but which, reportedly, had an "optically perfect" lens. No it didn't! 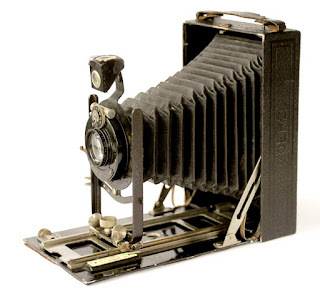 When the camera arrived, it was in about the condition I expected but the lens was dirty and cloudy. It's easy on these old cameras to unscrew the front and rear elements and I hoped a good clean with a microfibre cloth and some lens cleaning fluid would do the job. That removed most of the dirt but there remained a cloudy ring which would have badly affected sharpness and contrast until the lens was closed by a couple of stops. I thought it must have been between elements but then saw that the ring "disappeared" when moistened by the lens cleaning fluid, only to return when dry. After the application of some appropriately-named rubbing alcohol and much scrubbing, the cloudiness had all but vanished leaving a lens in pretty decent nick considering it's getting on for a century old. The lens is a 16.5cm f6.8 Kalostigmat which I think was towards the bottom of the company's range of optics. I'm fairly sure it does have the distinction, though, of being usable as a complete unit or with the front glass removed by which action it's focal length is considerably lengthened - a "convertible" lens. I'm not sure exactly what the secondary focal length is but a ballpark figure would be 280mm. I think it's usually a little less than double the normal focal length. You usually lose a bit more than a couple of stops as well making it something like an f16. The bellows has a double extension to accommodate this longer focal length. The controls on the camera, such as the focusing and lens movements, worked OK but were a little stiff and ratchety so I dribbled some 3-in-1 onto them and that sorted them out. Everything else enjoyed a good cleaning and the fine-grained leather covering was treated to some conditioner, partly to rehydrate the dry leather and partly to get rid of the musty smell that seems to pervade old folders. So far so good. Next I unscrewed the fold-out focusing hood from its frame and had a good look at the frame and its ground glass screen. 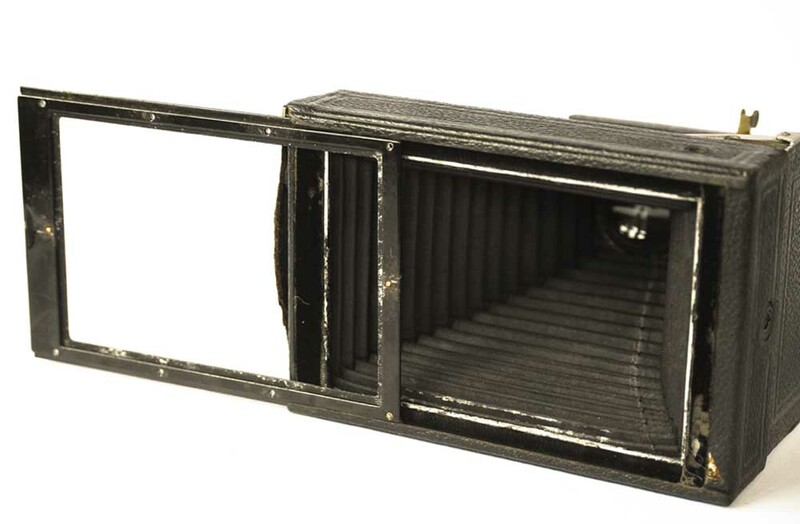 This slots into the back of the camera and would normally have been removed after focusing to make way for a film holder. It certainly looked possible to mate the frame to the 5x4 back but it would need an adaptor plate. I used an old Ilford Multigrade packet to make a template that would screw onto the frame using the holes that held the focusing hood in place. 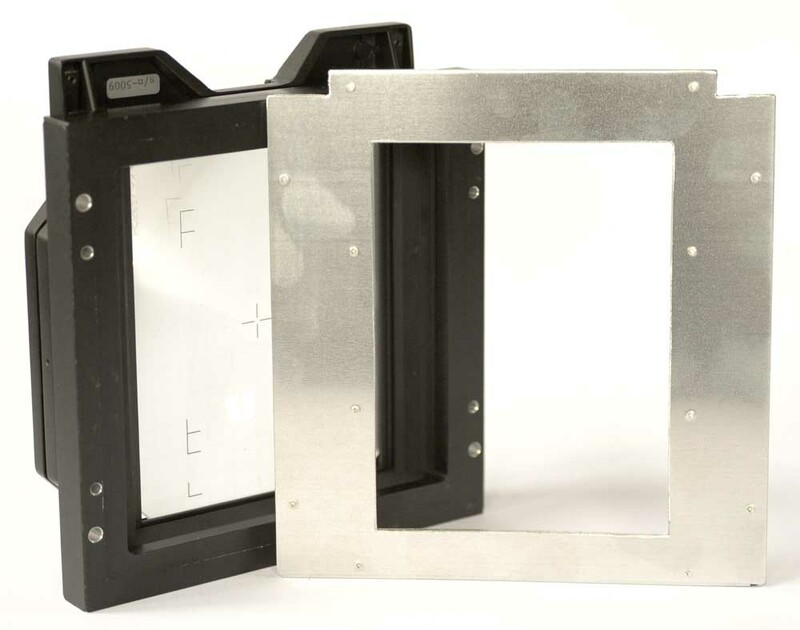 The 5x4 back would be bolted to the other side of the template giving me a back that would slot into the rear of the camera as easily as the original focusing hood did. The plate was made from 3 mm thick aluminium sheet and a punch was used to mark where the holes have to be drilled. And that's us up to date. This is as far as I've got and the next stage will involve drilling the holes in the garage and screwing 5x4 back, aluminium plate and camera together. Will it all fit? Will the screw holes all be in the right place? How the hell do I know - I haven't finished yet. We'll just have to wait for part two in a few days! Wouldn't it have been better to wait until the entire project was finished and then write about it retrospectively instead of just bashing on and risking making a fool of myself when it doesn't work? Yes. But where's the fun in that? Me neither! I'll need to get into the garage to finish it off. Good idea! I've been toying with a different design concept without a bellows, but this looks neat! Hope to see how it turns out. My first thought was to do something similar but this idea seemed simpler to me and my DIY skills are such that simpler is better! Half plate folders can be picked up for £15-£30 on the secondhand market so it's probably cheaper as well. The expensive bit is the 5x4 back. I'm not sure how much they go for - £80-£100?